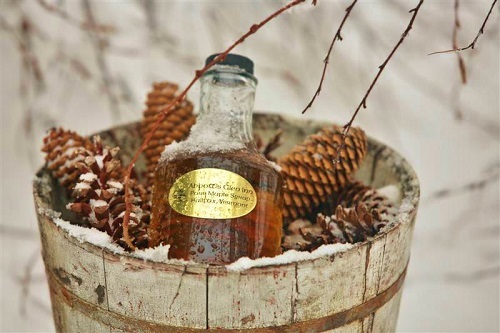 In March we have maple on our minds in Vermont. Oh and mud too, it;s definitely mud season. However, I am going to keep on with the maple theme. I have created a Maple theme dinner all month. Last weekend, I tried a maple mousse recipe from a foodie friend in the Philly area. She is always sending me great recipes and this one is over the top fabulous. Try not to think about the calories in this. Just commit to a walk, run & 100 sit-ups for the next 5 days and you’ll be fine! Place 1/4 cup of water in a small saucepan. Sprinkle gelatin over. Let stand 10 minutes. stir over low heat until gelatin dissolves. Remove from heat. Whisk syrup, yolks, liqueur and vanilla in top of double boiler. Set over simmering water and whisk until a candy thermometer registers 160, about 4 minutes. Remove from water, whisk gelatin mixture into maple mixture. Set the bowl over a bowl filled with ice. Stir until the mixture is cool. Then remove it from over the water. Beat the whip cream in a large bowl to stiff peaks. Fold 1/3 into syrup mixture. The fold syrup mixture into remaining whipped cream. 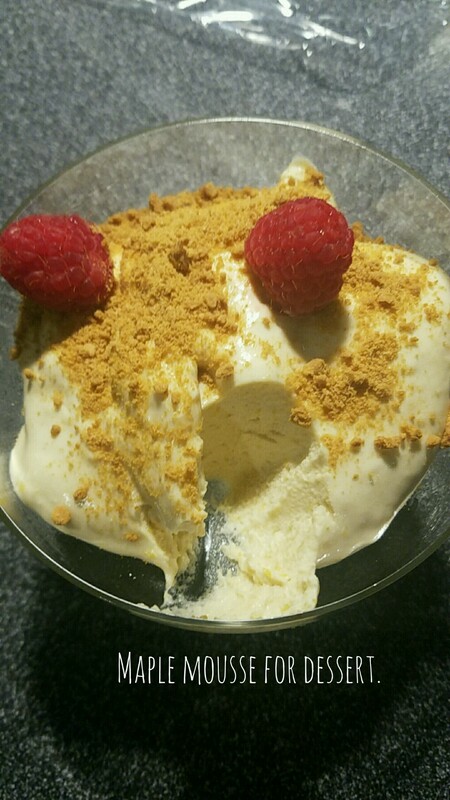 I spooned the mixture into clear glass goblets & topped it with gingersnap crumbs & a few fresh raspberries. Since it is so rich, 4 oz of this is a perfect amount. It can be refrigerated overnight or let it set for at least 4 hours in the refrigerator. Makes 8 larger portions or 12 smaller, depending on your glassware. Dining at Abbott’s Glen in October with our naturist friends is always so satisfying. The foods of autumn are so bountiful & nourishing. We find inspiration everywhere, from the last few leaves of kale in the garden to the baskets of apples we collect in our small orchard. Creating our menus to highlight the fall harvest is what this seasonal cooking is all about, and what guests expect when they come to our country inn, known for its food. Let’s set the scene for welcoming guests in the fall. 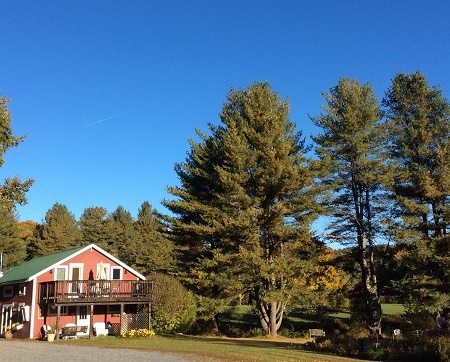 You drive down a long driveway lined with mature pines, cedars, and 100-year-old maples. A golden glow canopies the entire driveway as you approach the Abbott House. 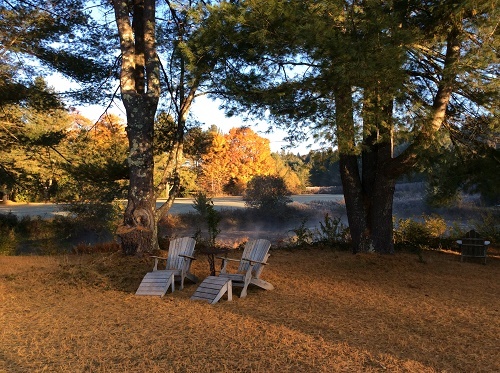 To the left of the driveway is a meadow punctuated by a pond and more stately pines. A cluster of red buildings with green tin roofs create a country scene, adorned this time of year with mums, pumpkins, and our dog, Tito (the official greeter!). Once parked, you are guided to the Meadow House check-in area. As you enter the main hallway, you see a fire in the lounge cracking with warmth. Two comfortable chairs beckon you to find a spot near the fire and enjoy a glass of wine or whatever. You are greeted by the Abbott’s Glen staff. With a warm hello, we dispense the information necessary to make our guests feel comfortable and on the path to a weekend of fun and relaxation! Once guests are shown to their rooms, we often find they have changed out of their clothes and into an Abbott’s Glen terry robe. Many guests meander over to the Carriage house, where entertainment is yours to make. From billiards to Foosball, darts, or dancing, there is something for everyone. 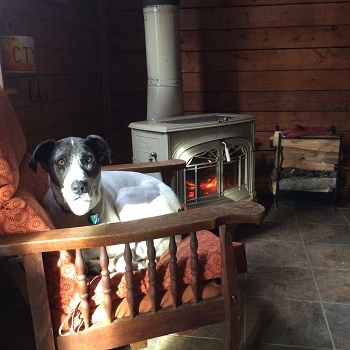 A wood stove heats this space and guests often gather in front of it to read or converse with other naturist guests. At this time of year, the Finnish sauna and hot tub take on fuller use as folks like to be warm, particularly our naturist friends. During the month of October, we always host a Vermont cheese & cider tasting on Saturdays, from 5:30 ~ 6:30, as a prelude to the evening meal. Generally, three or four cheeses are represented along with the labels of their producers. A bowl of olives, assorted crackers, and novelty meats, such as venison sausage, fill the gap between lunch and dinner. It’s cocktail hour without the cocktails (unless you provide your own–we do not have a liquor license). The Inn kitchen is located in the Meadow House. All those heavenly scents make their way through the Inn all day and start appetites craving for the beautiful dinner that awaits that night. This weekend was no exception. Our menu began with a butternut bisque, creamy and sweet, laced with a hint of nutmeg and topped with a dollop of sour cream. A basket of homemade maple oat rolls was a perfect buttered dipper for those last spoonfuls of soup. Our dinner buffet, set up on the side board, included a big wooden bowl filled with various greens, sliced apples, Vermont cheddar, and red onion. A new recipe for maple-ginger vinaigrette with soy sauce, ginger, and shallots topped the salad along with a sprinkle of salted pumpkin seeds. The entree of chicken breasts stuffed with wild rice stuffing, napped with a cider veloute, melted in your mouth. To accompany the entree, a roasted root vegetable medley, with some new and unexpected additions, had everyone wanting this next recipe. Our meal concluded with cups of coffee and a silky pumpkin custard pie topped with maple whipped cream. Ahhhhh, another beautiful dinner shared with guests, where conversation comes easily and new friendships begin. Full, relaxed, and feeling good after a few glasses of wine, guests headed over to Club Sugar Shack for some dance time with more fun to be had. 1. Preheat oven to 425°. Line a baking sheet with tinfoil. 2. In a large bowl, combine garlic, shallots, carrots, apples, radishes, Brussels sprouts & rosemary sprigs. Add oil & butter and toss to coat. Season with salt, pepper & rosemary. 3. Bake for 25 ~ 30 minutes until lightly browned and tender. Garnish with chopped parsley & more fresh rosemary. Serve immediately. Serves 8. 1. In a food processor, combine garlic, shallot, ginger, mustard, soy sauce, maple syrup, and balsamic vinegar until well blended. 2. With motor running on low, slowly pour oil through the feed tube & blend until smooth. 3. Adjust seasoning. Strain if desired. This is a delightful salad dressing, but can also be used to marinate salmon, pork, or beef. In a large bowl, combine eggs, egg yolks, white & brown sugars, 1 Tbs molasses, & all the spices. Add in milk, cream & pumpkin. Pour filling into shell. Bake 10 minutes at 450° & then turn oven down to 350° & bake an additional 40 ~ 45 minutes, or until filling is set. Serve with a dollop of sweetened whipped cream & a sprinkle of cinnamon. The 4th of July weekend at Abbott’s Glen is always one of our busiest. Naturist flock to the resort to enjoy Live Blues music, great BBQ and a great fireworks display. We served up some juicy pork ribs & organic raised chicken was mopped up with a Maple BBQ sauce & grilled until sweet & sticky. A big pot of Bourbon beans simmered on the stove with chopped peaches & a good swoop of Kentucky Bourbon. We always make a huge bowl of Slaw dressed with a Maple Dressing & sun dried cranberries. A big basket of Corn muffins flecked with sliced green onions & a touch of honey, always end up being the favorite item that everyone goes back for more. A crock of honey laced cinnamon butter accompanies the muffins and by then there is no more room on your big ole plate! Dessert comes later in the evening after we have danced off some calories to our 6 piece Blues Band, called The Reprobates. This weekend our community of Whitingham hosts its annual Maple Festival. If you are unfamiliar with the term sugaring & have wondered how that sap turns into syrup, then head to Vermont. Throughout the state, sugar houses will be open for touring. March is the month when maple trees are tapped. The temperature has to run below freezing at night & above 40 during the day in order for the sap to run.It takes 42 gallons of sap to produce 1 gallon of syrup. For a small operation like ours, that can mean a whole day of boiling to produce 1 gallon. It’s worth it though when you taste that sweet flavor in an updated chocolate chip cookie or maple walnut pie. I am including 2 of my favorite maple recipes from The Maple Syrup Cookbook by Ken Haedrickh. How sweet it is! 1.) Preheat oven to 425. 2.) In an electric mixer beat eggs on high for 2 minutes. Add maple syrup, brown sugar, salt , vanilla & flour. Beat to mix. Spread walnuts on the bottom of an uncooked pie crust. Then pour in egg mixture. 3.) Bake in the middle of the oven for 10 minutes, then resude heat to 375 & bake for 30 more minutes. The pie should be puffed & golden when removed from oven. Serves 8 ~ 10. Cool & serve with whipped cream or good quality vanilla ice cream. 1.) Preheat oven to 350. Grease 2 baking sheets. Cream butter in a large bowl with a mixer, slowly drizzling in the aple syrup. Dissolve the espresso powder in the hot water & add to creamed mixture with vanilla. 2.) In a seperate bowl, toss flours, nuts, baking soda & salt to mix. Stir into creamed mixture until incoporated. Stir in chocolate chips just until mixed. 3.) Drop by tablespoons onto baking sheet. Leave 2 inches between. Bake 15 minutes until edges begin to brown. Transfer to a wrack to cool.